Go beyond the classic spaghetti and meatballs with these clever spaghetti hacks! You know when you have a box of leftover spaghetti that won't close properly? Then someone goes in the pantry and boom! Dried spaghetti all over the place. 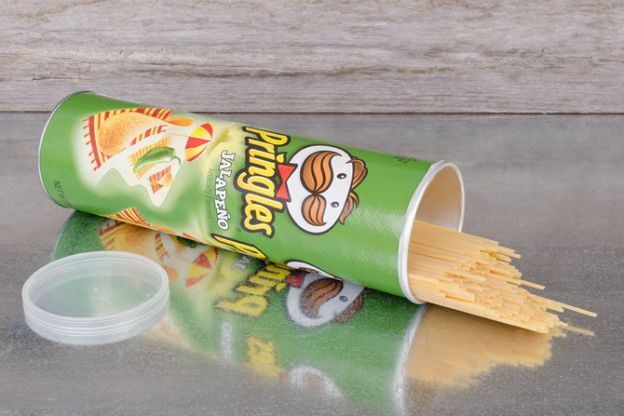 Avoid the hassle and the mess by using an empty can of Pringles (rinsed out) to store your leftover dried pasta strands. You can even decorate over the original packaging, and no one will be the wiser! This multi-colored Rainbow Shrimp Pasta is utterly delicious, and sure to impress when you serve it up! Boil the red and green spaghetti separately in salted water until al dente. Fry the shrimp in a pan with plenty of salt, pepper and paprika. Add 1/2 cup of cream cheese, and stir through until combined. Arrange the cooked spaghetti in an alternating pattern on a plate.